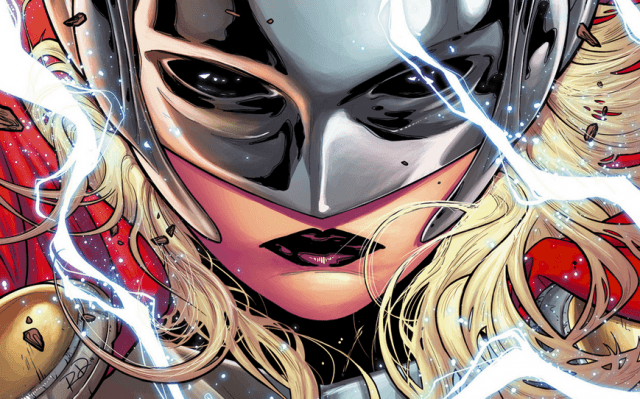 You may have heard that Marvel has turned Thor into a woman. What you probably don’t know, because you likely greeted the news with bafflement and horror and then resolved never to pick up a comic book from that company ever again, is just what a disaster the initiative is turning out to be. Thor a woman? It’s hard to believe the most macho, overtly masculine character in the comic canon could possibly be reimagined as a broad. But that’s almost certainly precisely the reason Thor was chosen: as a screw-you to so-called nerdbros from the achingly progressive staff of today’s comic book establishment. That last one’s not a joke, by the way: in 2011, Marvel unveiled a Spider-Man that was half-black and half-latino, called Miles Morales, to the consternation and confusion of ordinary comic book fans, as part of its Ultimate series of character reboots. We’re told “erasure,” whereby people’s pasts are scrubbed out by those in authority, is a social justice issue. Well, right now there’s erasure going in the basic, canonical biographies of some of Marvel’s most cherished superheroes. What sticks in the craw of the fans I’ve spoken to about female Thor is how utterly transparent the political posturing is behind the change. No one likes their thunder stolen but there is simply no good literary justification for making Thor a woman, they say–and the results have been execrable. You can write intelligent satire about masculinity without making a classic masculine icon into a girl, an observation that seems to have escaped Marvel’s writers. If I was directly addressing the Thor creative team and editors who seem to want gender equality in the Thor line, this is what I’d say. Make a damn effort to promote Thor’s female support cast; Jane Foster, Roz Solomon, Lady Sif, Valkyrie, hell even Angela since you’re bringing her in (and I have the feeling Angela is going to be the new Thor now.) Believe me when I say female characters need more promotion and treatment in comics but make them new characters or flesh out the old ones you have. Don’t shoe horn a female character into a male hero’s position as, at the end of the day, she’s still defined by the male character, not her own legacy. I know Marvel are going for the “anyone can wield the power of Thor, even women” approach but this is ultimately detrimental to the female hero. Why? Because making a female version of a male hero demeans the male hero and leaves the superheroine being solely defined as a female replacement of the male hero. This comment hits upon another reason why this new generation of “strong female characters” in movies, books and comics is absurdly counterproductive: it flattens women’s characters out to a few boring, stereotypically male characteristics such as physical strength. As this blog post from science fiction writer Vox Day suggests, “strong women” very often represent little more than men in women’s clothing, with none of the virtues or subtleties that female characters can bring to a storyline. “Most ‘strong female’ characters observably are not women, they are simply male characters dressed in female suits. They don’t talk like women, they don’t act like women, and when we’re shown their interior monologues, they don’t think like women either. They’re about as convincingly female as those latent serial killers who like to wear those bizarre rubber women suits. They are, in fact, the literary equivalent of those freaks,” says Day. Men don’t seem to care about gender-swapping great female characters, which rather gives away the game about the sort of agenda driving these awful decisions. Why is there a demand for female versions of male superheroes, but no demand the other way? I mean, have you ever heard of calls for a male Lara Croft? It makes very little sense, until you learn that comic books, fantasy and sci-fi were taken over years ago by ultra-progressive misandrists who basically hate their own core audiences. Does that sound familiar? It should: the recent GamerGate controversy in video games happened because ordinary gamers, unlike comic book readers or fans of fantasy and sci-fi, stood up to the authoritarian moral panic brigade in the press and their feminist agitator icons and said: no. We don’t recognise the world you’re sketching out, and we don’t want your bizarre and outlandish politics to pollute our hobby. Retroactive continuity and franchise reboots are being used today not to shine fresh light on the enduring themes of superhero stories, such as triumphing against the odds or the ultimate victory of good over evil, but for cack-handed, tone-deaf ideological reasons that simply aren’t resonating with most readers. This, in a nutshell, is what GamerGate supporters are concerned about when they say social-justice warriors will ruin video games. Because, while there’s no evidence that video games make people violent or sexist, there’s plenty to suggest that imagination-based hobbies are wrecked when the hand-wringing progressives come to town. Editor’s Note: a previous version of this article suggested that the incarnation of Spider-Man known as Miles Morales was bisexual, half-black and half-latino. In fact he is not bisexual. He is half-black and half-latino. We regret the error.